I recently returned from a week long trip to Colorado. This was my first time fishing in Colorado, and I narrowed down my efforts to the Frying Pan River near the town of Basalt. I landed in Denver and picked up a rental, driving four hours through the mountains. 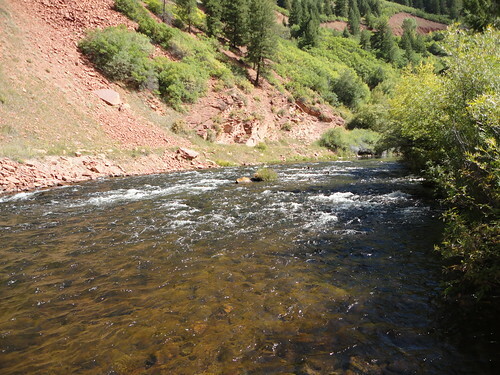 The Frying Pan, a tailwater, offered many miles of public access, and connected to the Roaring Fork River a short walk from my motel. I arrived on Sunday just in time to get a fishing license, check in and wet a line for thirty minutes. On Monday morning I drove up the Frying Pan to the first mile below Ruedi Dam. The road hugged the river most of the way, and I marked some good looking pull offs on a map. The section below the dam was popular, as anglers and guides were all suiting up when I arrived. Even with twenty to thirty anglers nearby I walked into a nice spot below a low head dam. The sun was just starting to break over the mountains, and when it did a good midge hatch began. I was rigged with a mysis shrimp pattern and small midge larva pattern under an indicator. It wasn’t long before browns and bows began rising in the soft spots below the small dam. I caught my first fish on the shrimp pattern, a smaller wild brown. I eventually swapped out the shrimp for a zebra midge pattern, and by lunchtime landed eleven trout. I drifted my midge tandem rig through the risers using 6X tippet, and watched the Thingamabobber take off. The browns and bows I landed ranged from seven to fourteen inches, but I stung a few larger fish in this run. I headed back into town for a quick lunch and began working my way up the river from the lower sections. It was clear after a few minutes of surveying the water that the midges I had on the line were not likely to produce. I could see a number of large and small mayflies peeling off the water. The small gray baetis were in the 20-22 range, and a few larger mayflies were tan bodied in a size 14-16. I even saw some larger green drakes hatching. After a few minutes I noticed one nice brown flashing under the surface in a riffle. After a number of unsuccessful drifts with tandem nymph rigs, both big and small, I noticed some size 16 caddis crawling on a log. This became an ephipany of sorts, as the next pattern I tied on became the Go-To-Fly for the week. I tied on a small brown bodied Caddis Sparkle Pupa, and the brown took on the first drift. I spent the rest of the day trying different patterns, and pull offs along the road. I caught a good hatch with rising trout taking very small midges before dark. I ended the afternoon with more fish than I caught in the morning, but nothing big. 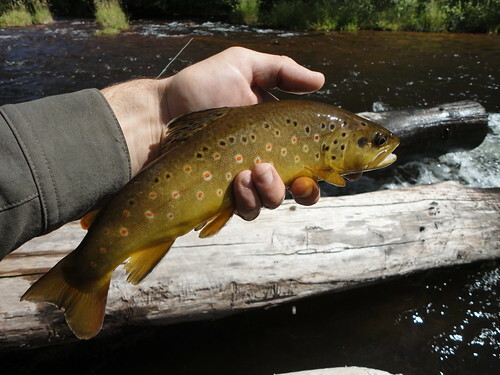 I hooked a few fish between 15-17 inches, but only landed one thick fifteen inch brown. The lower sections of the Frying Pan reminded me of the Savage River, with rough pockets, deep slots and rock ledges. I decided that day to stay on the Frying Pan for the remainder of the trip, instead of spreading myself thin on other rivers. The Roaring Fork was close by, but I already locked down a few hatches, and I had plenty of the patterns the Frying Pan trout were willing to eat. The latest video post features footage of the drive through the mountains, river shots, and some of the trout I caught on day one. This entry was posted in fishing report, video on September 21, 2010 by Jason du Pont.